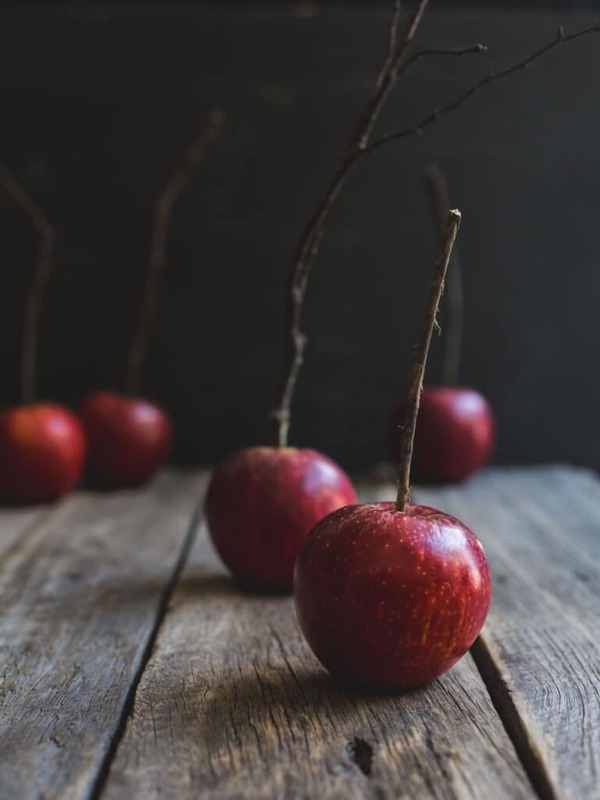 These Deliciously Dark Halloween Apples tickle my sense of whimsy. Made with charcoal, these black beauties are ready to cast a sweet spell on All Hallow’s Eve. Halloween dates back to the ancient Celtic festival Samhain (pronounced sow-in). Around two thousand years ago, the Celtic people celebrated the new harvest year on November 1 marking the end of the warmer months and the harvest period. The day also heralded the coming of Winter, a time associated with the cold and death. The day before the new harvest year, the Celts celebrated Samhain believing it to be the day the spirits of the dead returned to earth. To ward off the ghosts who it was believed damaged crops and caused general mischief, the people would wear costumes and light bonfires. It was also believed the arrival of the ghosts made it easier for the Druids to predict the future. In the eighth century, Pope Gregory III marked November 1 as All Saints’ Day honouring saints and martyrs. The celebration included some Samhain traditions while the day before was known as All Hallow’s Eve and later Halloween. Halloween, as we now know it is a far more child-friendly celebration of all things spooky and kooky and I just love it. We don’t have anything like the festivities our US friends enjoy, but we do our bit. The village store owners get in the spirit by donning costumes and letting the smaller kids trick or treat in the safety of the daylight hours. This year the Elf is three and a half and is determined to be brave and join in on all the icky fun. Her costume of choice? A zombie doctor. Her inspiration? I have no idea. 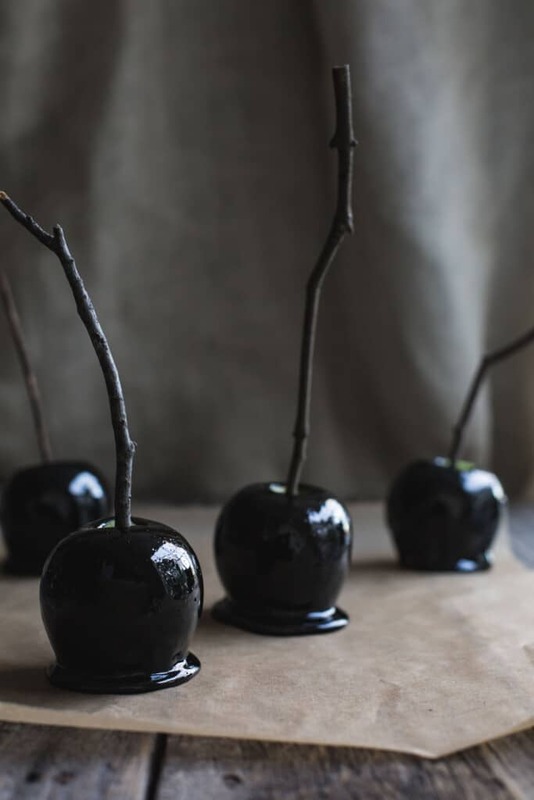 Meanwhile, I have been in the kitchen brewing up these gorgeously shiny, deliciously dark toffee apples using food grade charcoal and a dash of alchemy. With a little care, these black beauties are ready in around thirty minutes and I think are the perfect amount of spooky. I foraged in our garden for sticks to complete the effect but you can use regular wooden pop sticks. I learned a few things in the days standing over my cauldron testing these little treats. 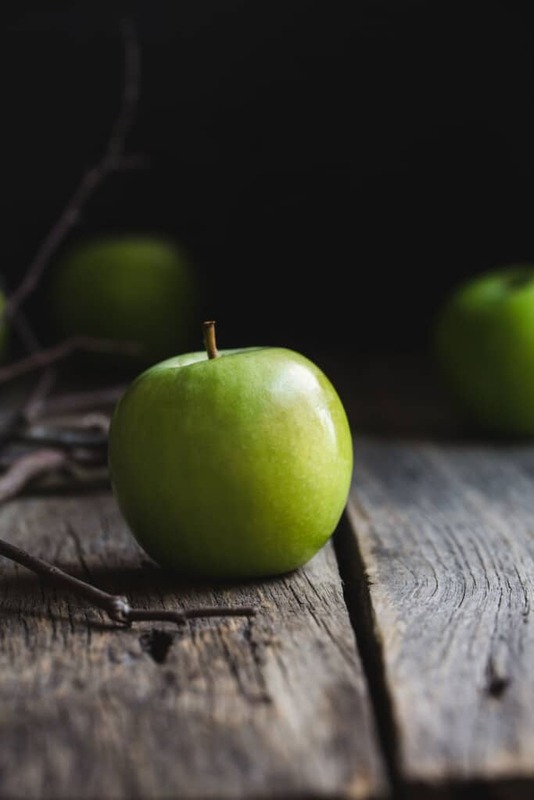 Firstly, Granny Smith Apples work best for toffee apples; the toffee puckers and bubbles with other varieties and while they taste fine, they don’t look the part. We want smooth and devilishly inviting poison apples, don’t we? And secondly, I found the dipping process far easier with the heat under the toffee pan turned to low instead of turned off completely. You have to be super careful, but the heat keeps the toffee thin while if you remove it from the heat, the toffee begins to thicken making it hard work. 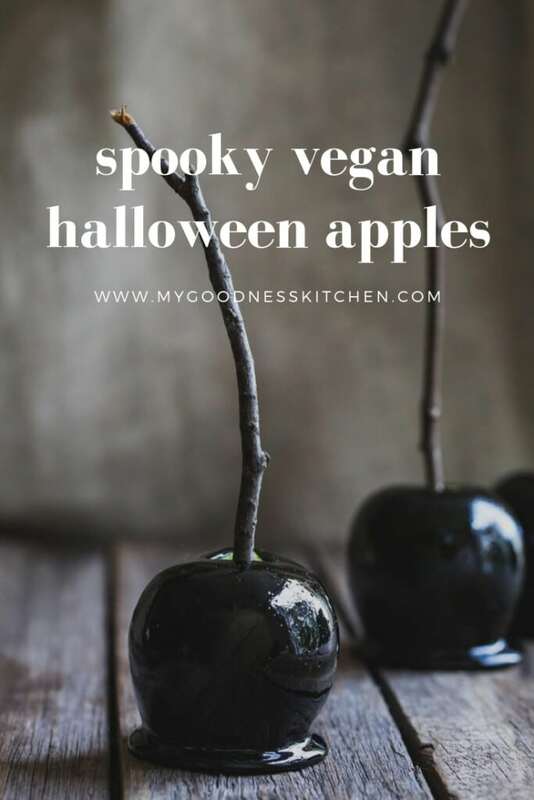 Needless to say, this is a not a kid friendly activity but they will love these scarily beautiful, deliciously dark Halloween apples when they are cooled. The black toffee cracks perfectly revealing a juicy green Granny Smith. Wonderfully spooky and delicious to boot. Ah, whimsy. I do love you. Enjoy. 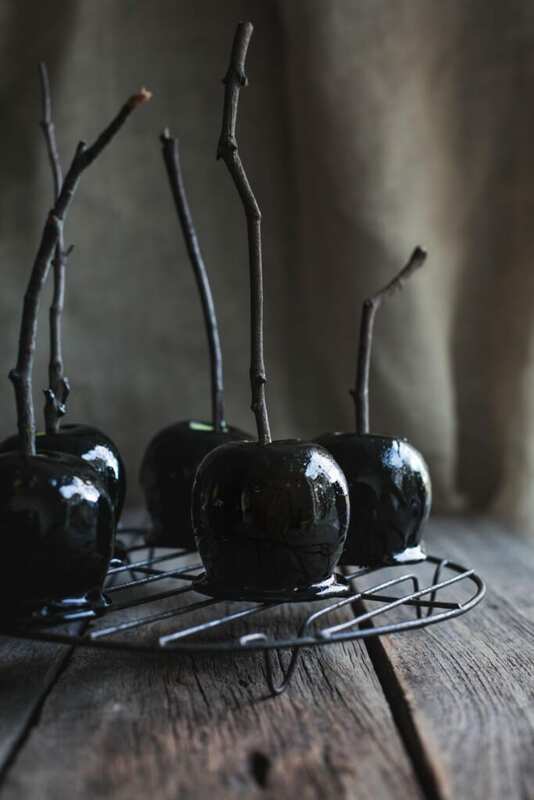 Made with charcoal, these Deliciously Dark Halloween Apples are are simple to make and ready to cast a sweet spell on All Hallow's Eve. Place all the ingredients in a medium sized, heavy based saucepan and put over low to medium heat. While stirring, bring the toffee slowly to a boil allowing the sugar to melt completely. When the toffee comes to the boil, stop stirring and allow the mixture to bubble away until it reaches 150 degrees C (cracking point). This can take anywhere from 10 to 20 minutes. Use the wet pastry brush to wipe away any crystallisation from the sides of the pan. If you don't have a candy thermometer, drop a small dollop of toffee in a cup of cold water. If the toffee is ready, it will harden and need to crack to be broken. Remove the thermometer for the next step. When the toffee is ready, turn the heat to low and very carefully tip the pot on an angle. Holding the apple by the stick, gently swirl the apple in the toffee. When it is coated, hold it above the toffee to drip before placing it back on the lined tray to harden. Repeat with the remaining apples. Leave the apples for around ten minutes to completely set before placing in cellophane bags or simply serve. Bring the lined baking tray as close to the pan as you can when dipping to reduce the risk of burning yourself. 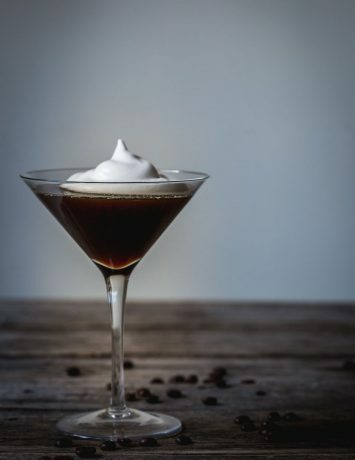 I used activated charcoal made from coconut in this recipe.